CLASSIC 1984 MERCEDES 300D W123 LONG WHEELBASE LIMOUSINE COSTA RICA: CCC purchased and is restoring a 1984 300d mercedes w123 long wheelbase sedan Limousine for all of COSTA RICA'S CALL CENTER'S clients. Her name is DAISY. 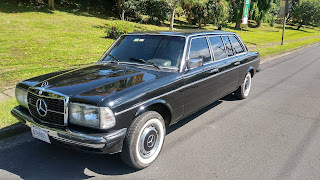 Richard Blank, the proud owner of a classic Mercedes Limo, wanted a similar customer relationship experience just like the famous REMINGTON STEELE back in the 1980s. Yet, there was a lot of work to do that is still in progress: a custom made wood Art Deco wet bar, new chrome, black interior, killer paint job, limo tint, new rims and restored classic hub caps. We changed her to an automatic transmission and placed in the best alarm and sound system. Finally, a very special mix of retro style for the personal touch while crusing in style the beautiful costal and city highways of Costa Rica.